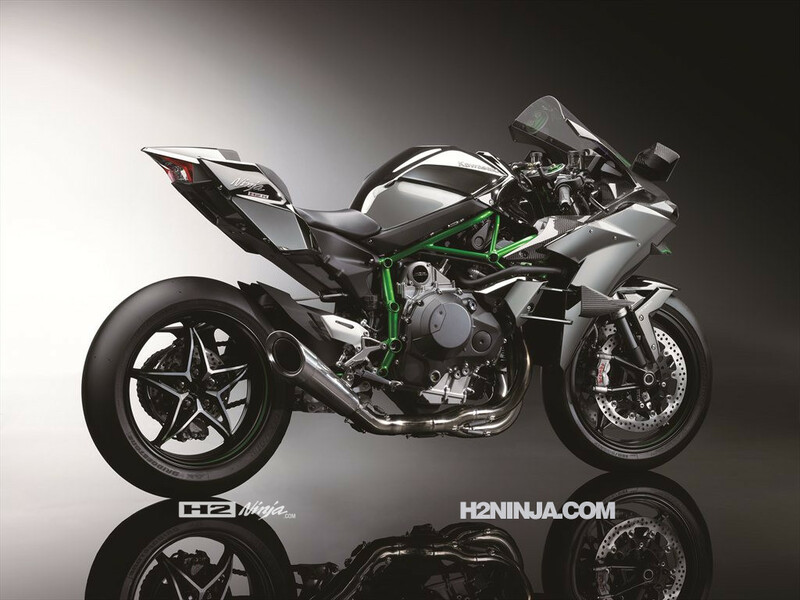 After a month long teaser campaign Kawasaki hit the stage at the Intermot bike show to unveil the secretive 2015 Ninja H2... R. The track only model is now official, but data on the new bike is limited so far, and we don't get to see or learn about the street legal model until November's EICMA show. Click on the images for high res versions of each photo. 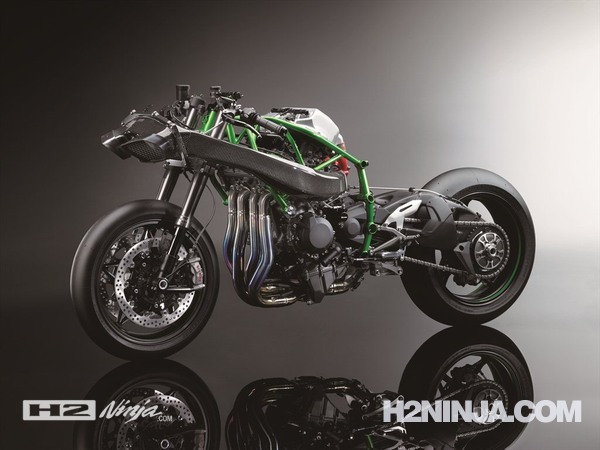 When the Ninja H2™R motorcycle was conceived by Kawasaki, the driving concept behind its development was to offer the kind of acceleration most riders had never experienced. 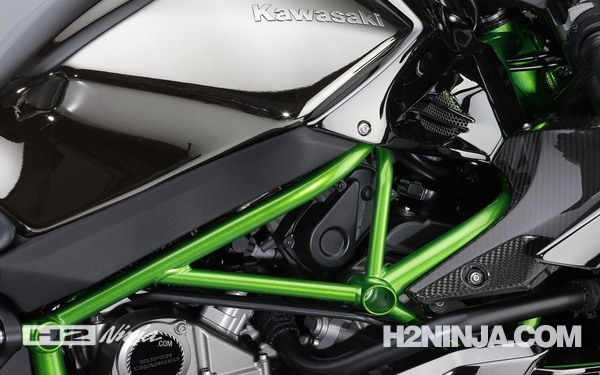 Being “Fun to Ride” is one of Kawasaki’s guiding principles, and while there are many ways for a motorcycle to be enjoyed, strong acceleration was considered to be a major factor in delivering rider exhilaration. 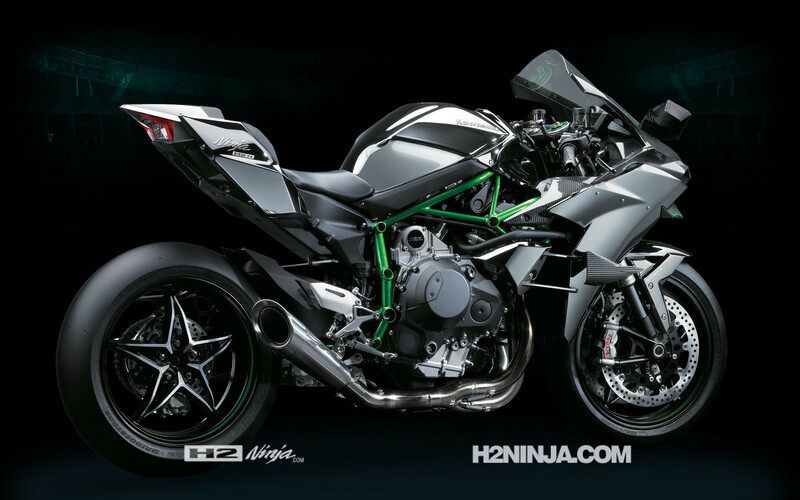 To achieve this goal, the Ninja H2R is powered by a supercharged engine and boasts power output in the region of 300hp. 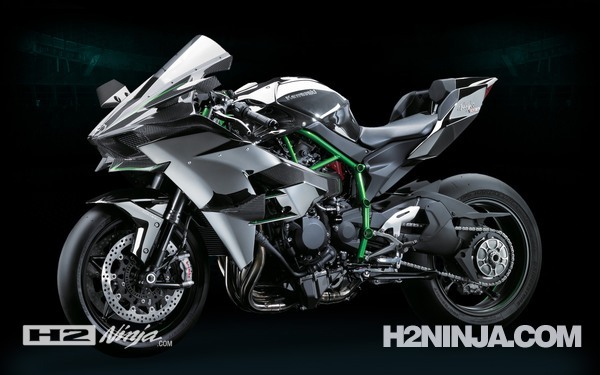 Yet it has a compact design similar to power units found in the supersport category. 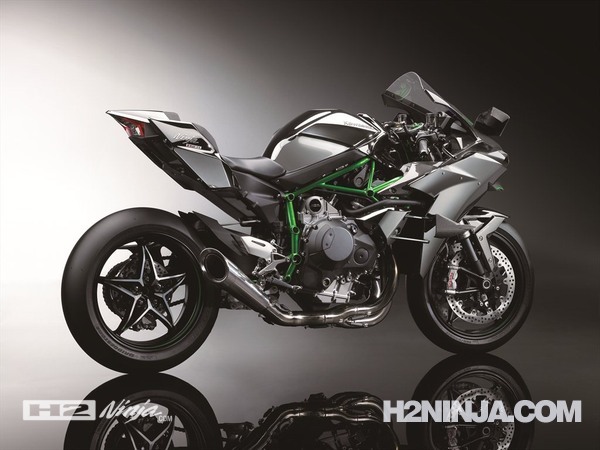 Although the Ninja H2R will be a production motorcycle, its huge horsepower means it is only available as a closed-course model. 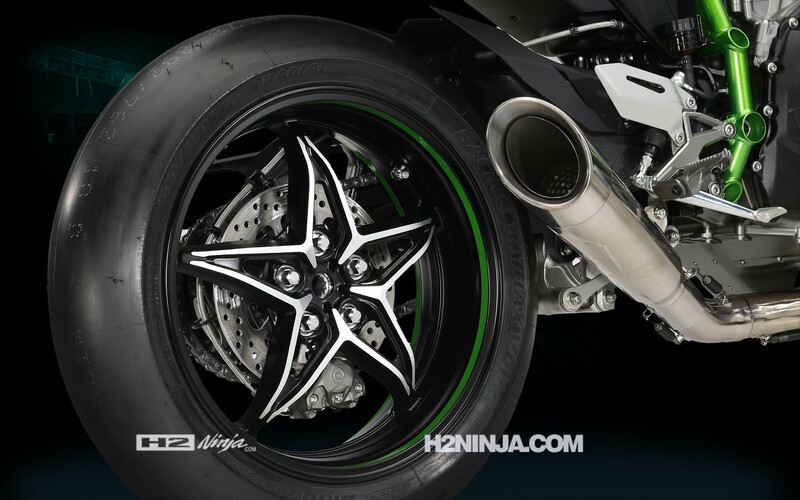 Fitted with slick racing tires, it may not be ridden on public roads and should only be ridden by experienced riders. The key to achieving the incredible performance lies in the supercharger, which was designed specifically for this application and completely in-house. 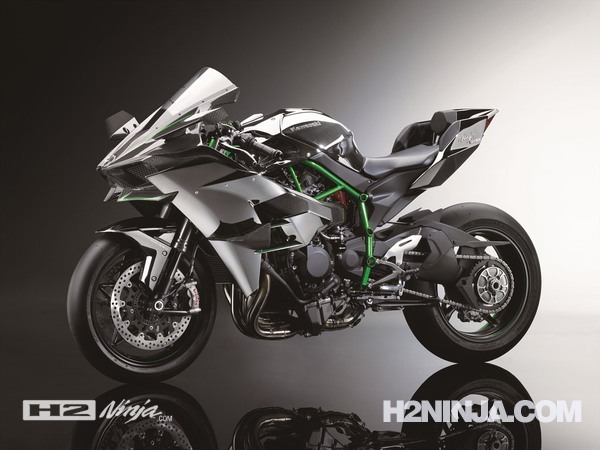 Its development drew on technologies from other companies within Kawasaki Heavy Industries, Ltd. (KHI), such as the Gas Turbine & Machinery Company, Aerospace Company and Corporate Technology Division. Technology created by the KHI Group was not limited to the supercharger. 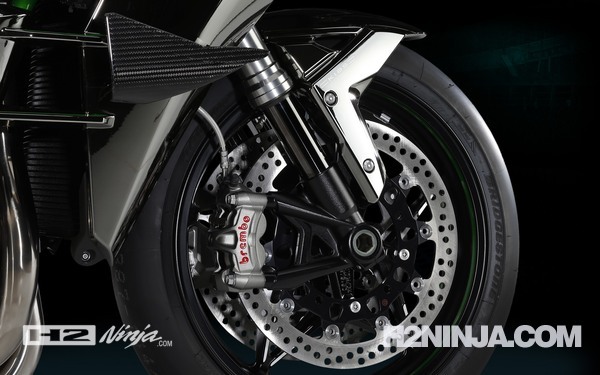 In fact, shared technology from other group companies can be found throughout the all-new engine and chassis. 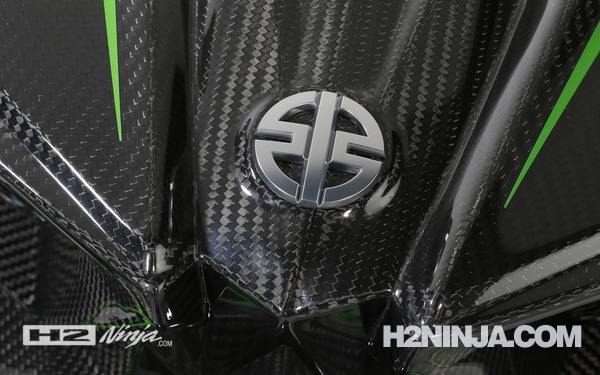 For example, the carbon-fiber upper and lower winglets were designed with assistance from Kawasaki’s Aerospace Company. 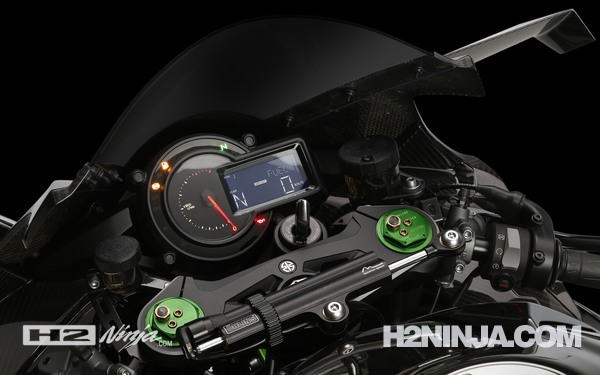 These parts increase stability when riding in the ultra-high speed range and were critical to the motorcycle’s overall design. 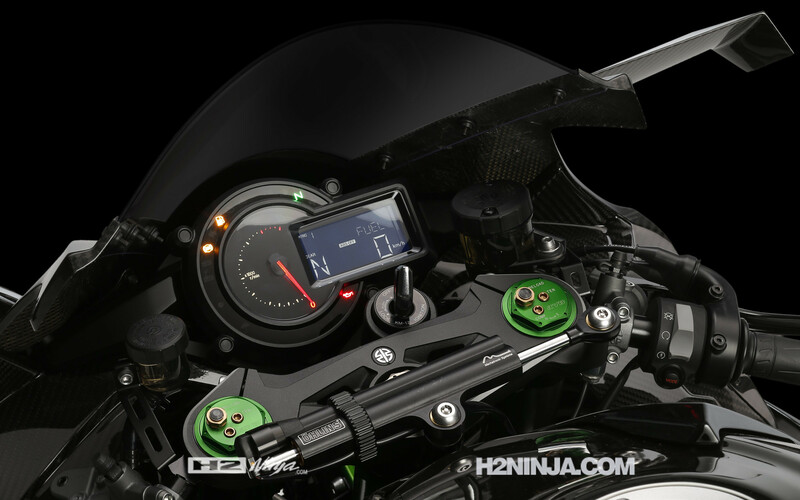 This is one example, but the KHI Group collaboration and the level of technology poured into the new motorcycle is why the Kawasaki River Mark* is prominently displayed on the front of the Ninja H2R. 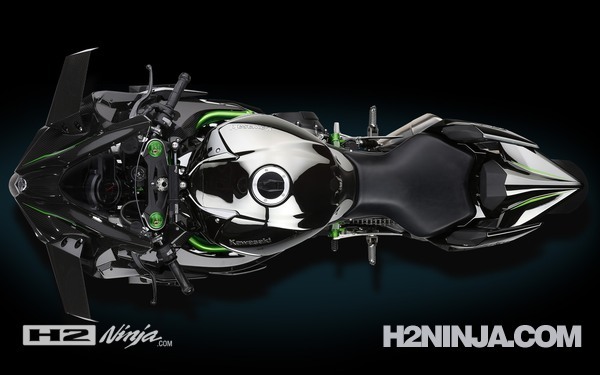 When it came to naming the motorcycle, “Ninja” was an obvious choice because it is synonymous with Kawasaki performance and has been shared by many legendary Kawasaki models over the years. 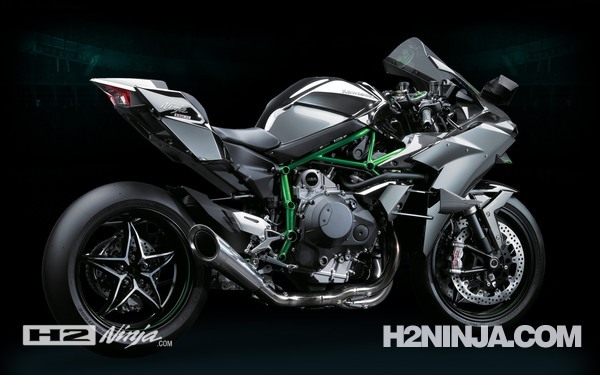 Its model designation is also derived from another iconic model, with its 750 two-stroke Triple that gave it intense acceleration, making it a sensation around the world: the 750SS Mach IV, also known as the “H2.” For a model designed to offer “the kind of acceleration no rider has experienced before,” Ninja H2R is the ideal name. Built Beyond Belief. 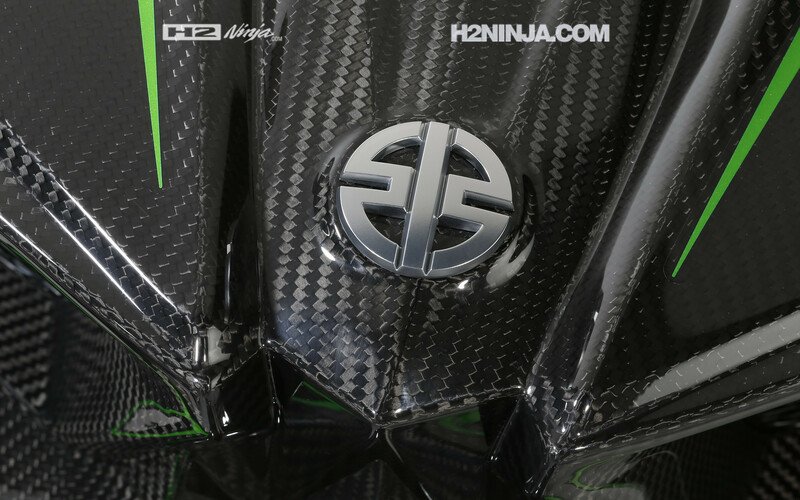 Kawasaki is ready to unleash a new sensation on the world: the Ninja H2R motorcycle. 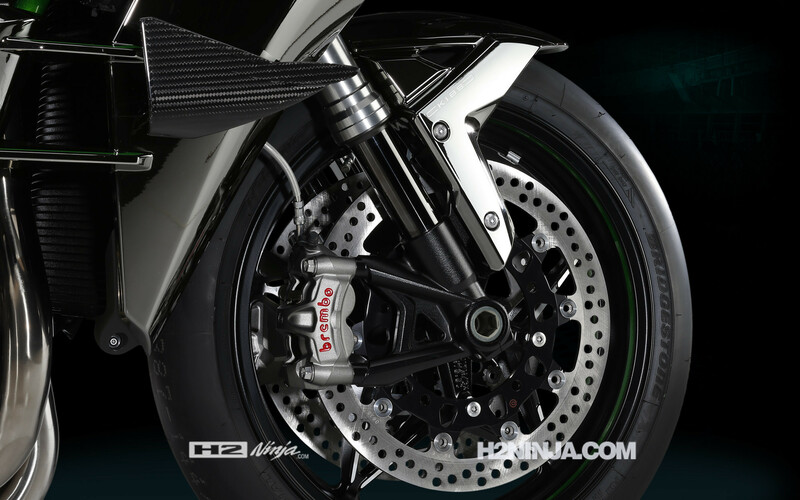 In order to offer intense acceleration and a top speed most riders will never experience, it was essential the engine could produce substantial horsepower. While a large-displacement engine could easily provide high output, a compact engine was preferred to ensure a lightweight, compact package. 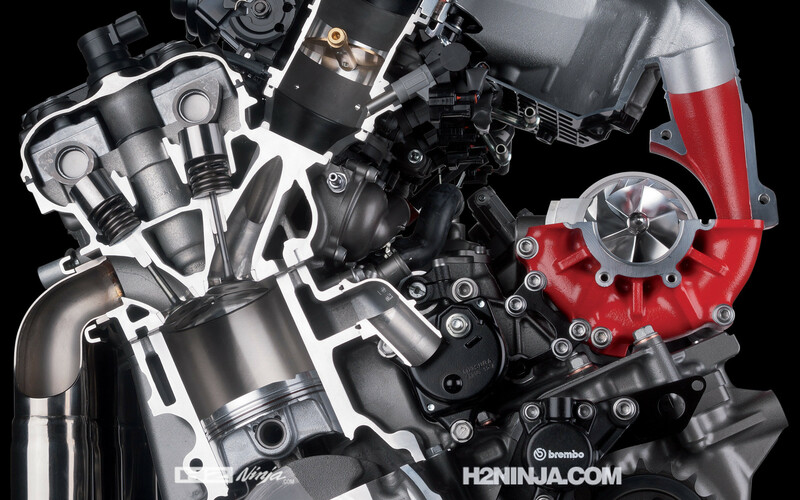 A supercharged engine is able to provide high-performance in a downsized package, meeting the project’s requirements. 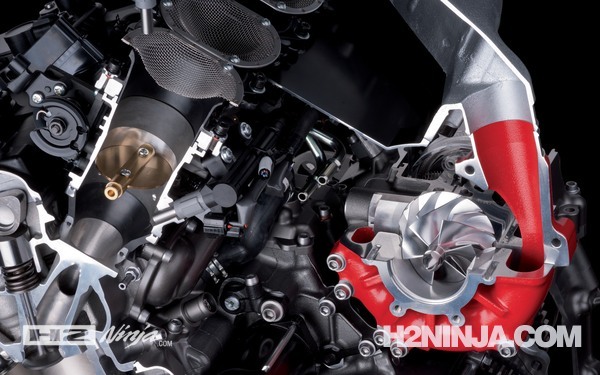 As a result, the 998cc in-line Four has a maximum output of around 300hp. 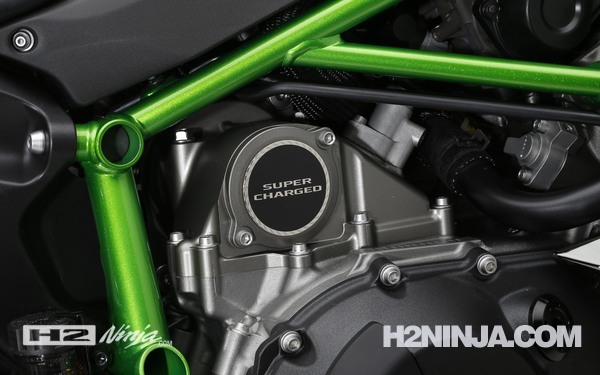 The supercharger in the Ninja H2R was designed by Kawasaki motorcycle engine designers with assistance from other companies within the KHI Group, namely the Gas Turbine & Machinery Company, Aerospace Company and the Corporate Technology Division. 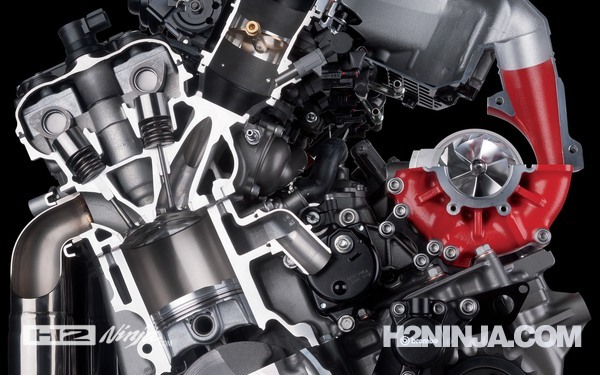 Designing it in-house has helped to match the characteristics of the 998cc four-cylinder engine. 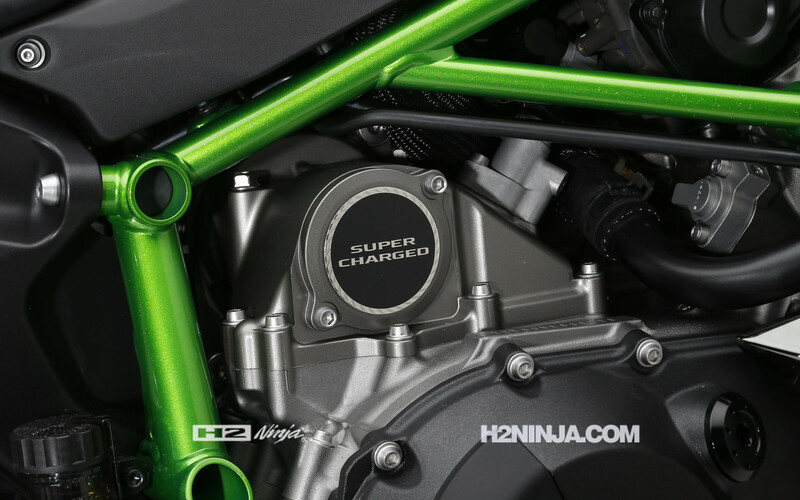 The highly efficient, motorcycle-specific supercharger was the key to achieving the power and intense acceleration the engineers desired. 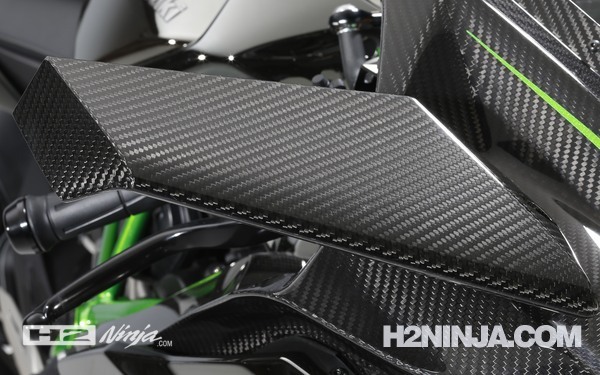 The objectives for the Ninja H2R chassis were to provide stability at ultra-high track speeds, and offer cornering performance to be able to enjoy circuit riding. At the same time, it needed to have an accommodating character. Ordinarily, high-speed stability can be achieved with a long wheelbase. However, the engineers wanted a shorter wheelbase to achieve the compact packaging and sharp handling that were also desired. Furthermore, the frame needed to be stiff, yet had to absorb external forces encountered while riding in the ultra-high speed range. 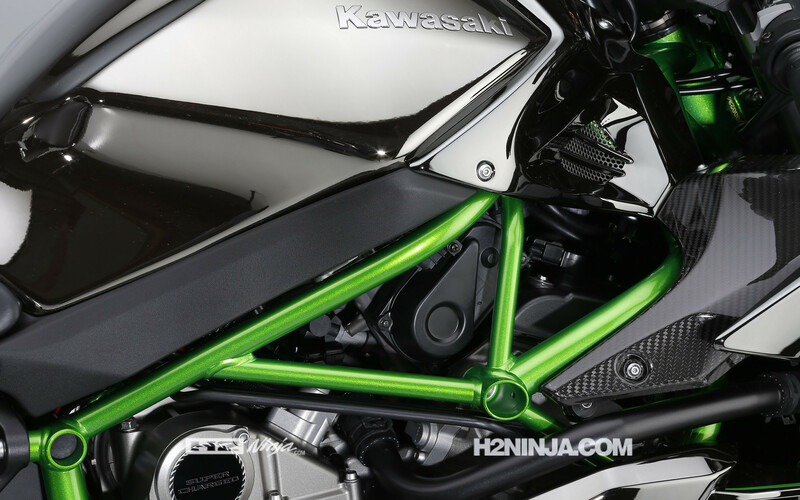 Such conditions could easily unsettle the chassis, so a new trellis frame was developed using the latest analysis technology. It provided both the strength to harness the incredible power of the supercharged engine, and balanced flex to help stability for high-speed competition riding. Since wind resistance increases exponentially with speed, the Ninja H2R needed a combination of high power and smooth aerodynamics to operate in the ultra-high speed range. 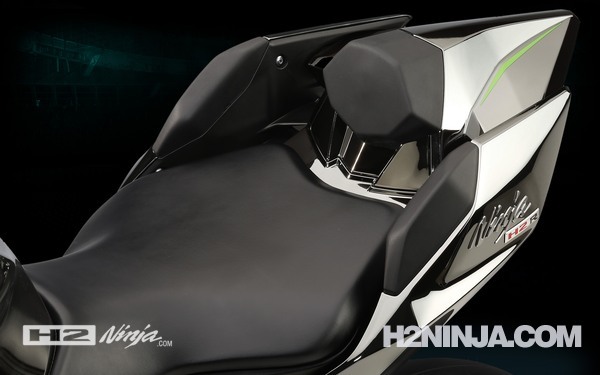 With the power requirements taken care of by the supercharger, the next step was to design bodywork that both minimized aerodynamic drag and increased stability when riding at speed. 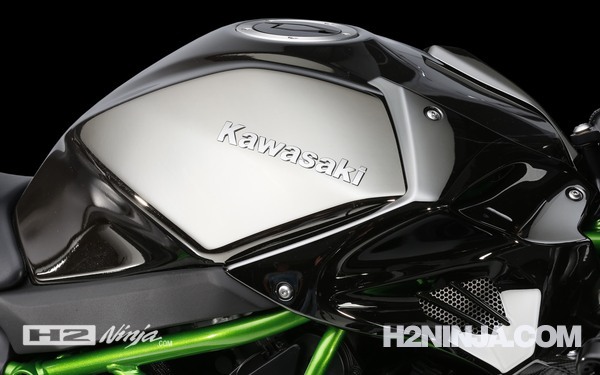 Kawasaki’s Aerospace Company was enlisted to assist with the creation of the wind tunnel-sculpted bodywork to help aerodynamic efficiency. 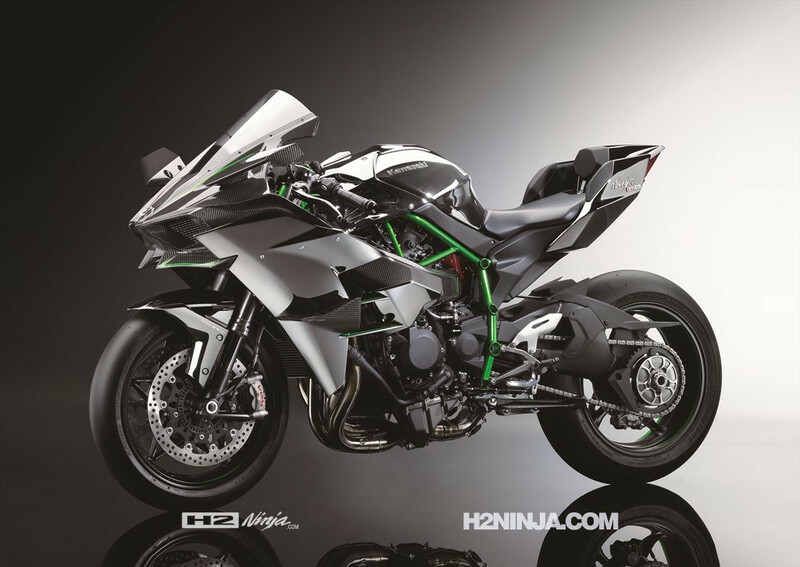 As a flagship for the Kawasaki brand, the Ninja H2R required presence and styling that reflected its incredible performance. And while the design looks the part, it has a functional beauty, with each piece of bodywork aerodynamically sculpted to help ultra-high speed stability. 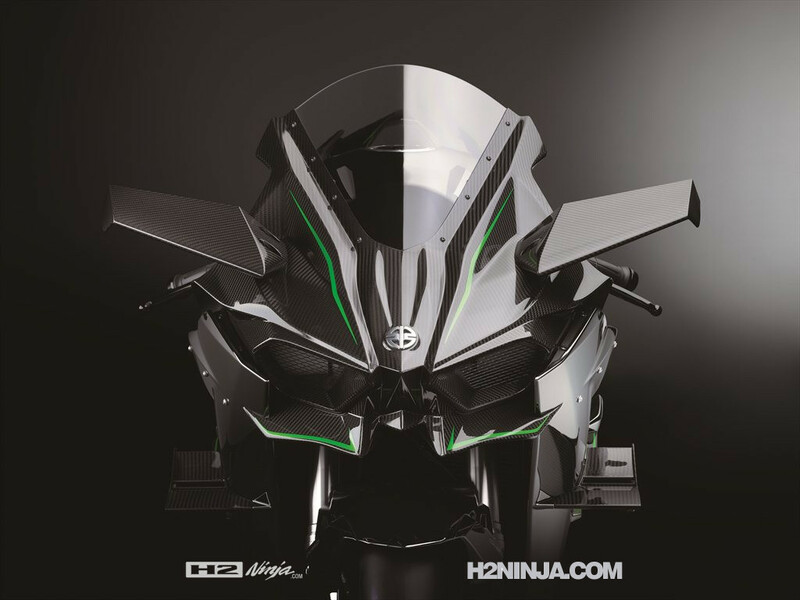 The cowling design also maximizes cooling performance and heat dissipation, helping to achieve the engine’s circa 300hp output. And the Ram Air duct is positioned to bring fresh air directly to the supercharger. More than any motorcycle Kawasaki has built to date, the Ninja H2R is a showcase of craftsmanship, build quality and superb fit and finish, right down to its high-tech mirror-finish black chrome paint that was specially developed for this model. 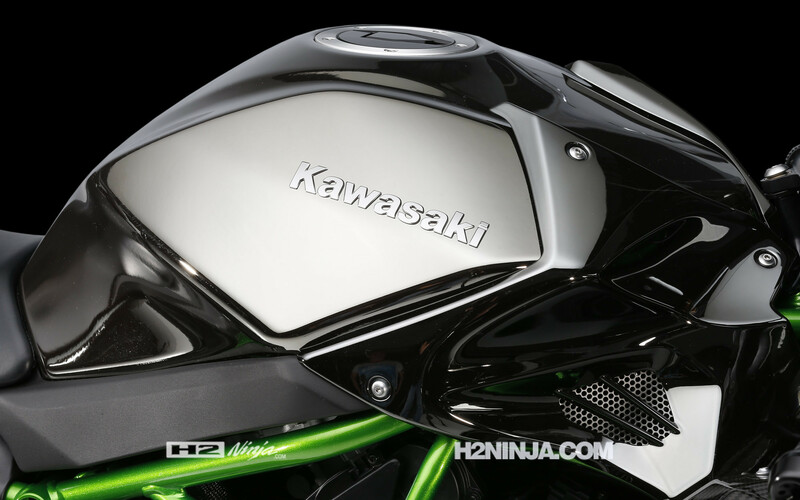 *The Kawasaki River Mark is a well-established symbol of the KHI Group, dating back to the 1870s. As a policy, it is rarely used on products and is limited to models with historical significance. 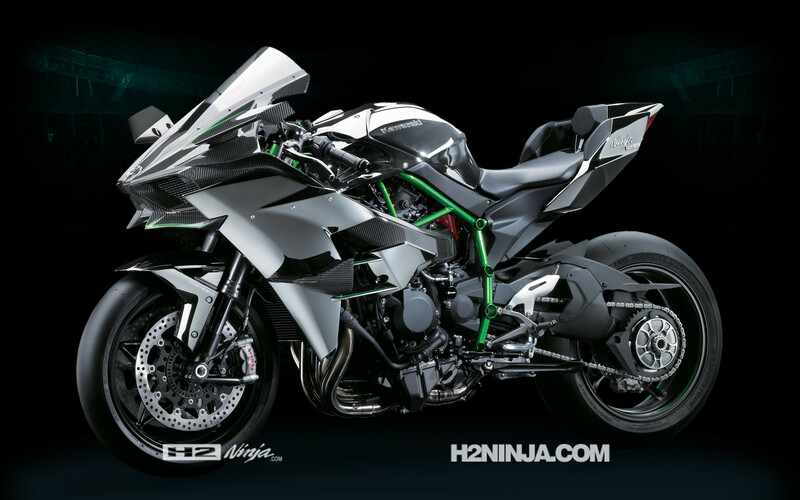 As such, permission was granted for use on the Ninja® H2™R motorcycle.